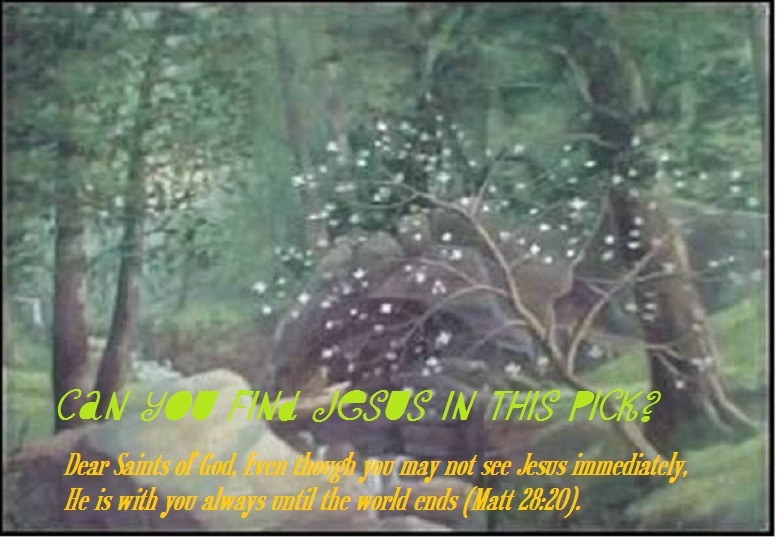 Apostolic Revelation: Jesus is With You Always! Jesus is With You Always! Many times when we are alone, that is when we are tempted by the devil. Yes Jesus was driven in to the wilderness by God the Holy Spirit for this purpose (Matt 4:1). God's appointment for an increased anointing does not come in public without us having private confrontation and victory over the devil. When you are tempted by the devil in your private time, remember the lie that the devil will try to insert in to your mind again and again saying, "Where is your JESUS, now that you are facing trials and temptations?, Has he arrived to help and deliver you? Jesus has no power over the sinful bondages or else he would have instantly delivered you like other believers say in their testimony? You are condemned sinner, so God hates you and has no love for you? You are sick and weak because of sin and God has punished you for it, etc..."
Who are you going to believe at this point of intense temptation? The report of the Lord or the devil's report of unbelief. How much you believe God during those times determines how much blessings and power of God you will experience after the trials will be over. This trial too will go and does not last for ever. But the faith with which you responded during your trials will be recorded in the history books of heaven. Hear what Apostle Peter says, "6 In this you greatly rejoice, though now for a little while, if need be, you have been grieved by various trials, 7 that the genuineness of your faith, being much more precious than gold that perishes, though it is tested by fire, may be found to praise, honor, and glory at the revelation of Jesus Christ." (1 Peter 1:6-7). When we are going through trials we will never know that we are being tested by God, until we stand by faith and see the victory, reward and promotion we get after the trials gets over (Psa 119:71, 75, 92; Job 23:10). When you respond by faith to trials you will be purified and trusted for kingdom promotion or else you will be running a spiritual rat race inside a cage. God always stay put a person in a place until they realise that tests and trails are for their good. God is more concerned with the attitude of His children's than their immediate comfort. It good to face trials and ask God for strength to overcome it as soon as possible. The more we are determined to face the unknown fears that lurks to keep us in the rat cage, the faster we will come in to the freedom of the Spirit of faith. Face the fear with the words of faith spoken through your mouth (2 Cor 4:13). This is the way all the saints of God will be able to overcome Satan's evil deception of unbelief. The same thing is said of the saints of the soon coming worldwide Tribulation in which they will overcome Satan "by the blood of the Lamb and by the word of their testimony" (Rev 12:11, a). Unbelief is a soul life that should not be loved but hated with a holy hatred. HIS WORD SHALL STAND FOREVER!" Martin Luther faced trials after trials from the evil one and won all of it by faith and confession of the word of God. Here is what happened one night after he worked himself to exhaution and was made to be the target of the assaults of the accuser of the brethren. That night the Devil came and stood before him in a sort of vision. The Devil said: "Are you Martin Luther?" "Yes," he replied. "You preach justification by faith, and that you are saved thus?" "Yes." Then the Devil pulled out a great roll, and read about Martin Luther by giving the place of his birth, etc. "Yes, that is true," said Luther. Then there was a little black record of a sin in it which showed all his transgressions, way back from his earliest childhood. ''Yes," said Luther, "I did it, I did it." Then another—then another. "Yes," he said, "Yes," but his courage and bold faith didn't fail him. And yard after yard of that dreadful roll began to be unfolded by Satan, and as all the sins of his thoughts and deeds were revealed to greater and greater accuracy, the poor man couldn't stand anymore against Satan but sat trembling before that fearful record of a life-time of sin. And the fiend said; "And you are going to heaven? Ah, what presumption!'' Luther says he was almost ready to give it up. But the Spirit of God whispered in his ear, "Tell him that that is all true, but the blood ot Jesus Christ cleanses from all sin." "Yes," shouted Luther, starting up, "Yes, foul fiend, you have not painted it half black enough, but you forget to put at the bottom of that record of sin that the blood of Christ cleanses from all sin." So saying, he took an inkstand and flung it at the head of the fiend who fled at the mention of the Lord. What can we learn from this, face the trial but know that Jesus is with you all through the time of your trial. Do not ever doubt His promise, but only beleive. Jesus said, "... I am with you always, even to the end of the age." (Matt 28:20). When you are conscious of the presence of Jesus living in you and with you by faith (John 14:17, 23), immediately the Holy Spirit will quicken you the right truth to confess through your mouth for every situation. Then as you say it, the victory of Jesus will be yours for the GLORY OF GOD! When you feel that you can't stand the trial anymore, that is when you are availing the power of the supernatural to your situation which brings you out of your trial immediately. The anointing works powerfully in you when you feel the weakest and the most inadequate.